Breyer's West Wind Stable fits 3 Classics Size Breyer horses. Stall doors open and close. Whether riding the trails or working the ranch, this western rider and her trusty sorrel steed are ready! Hand-painted! 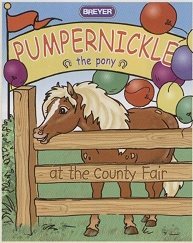 Includes: 6" fully articulated rider, horse, saddle pad, Western saddle and bridle. Intelligent and built for speed, the Akhal-Teke Mare (Buckskin) is nicknamed the ''Golden Horse'' in her native Turkmenistan. CollectA's replica beautifully reproduces the metallic sheen of this horse's coat. The Akhal-Teke is known for its endurance. CollectA' s Barock Pinto Stallion encompasses all that's beautiful about this breed, from the flowing mane and tail to the horse's noble head. Lifelike and realistic in every detail, the Barock Pinto Stallion measures 6.1''L x 4.9''H. The Ardnnes draft horse breed's nimble action, stamina and good temper make them increasingly used for competitive driving across Europe. 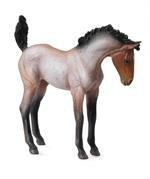 This beautiful dark bay draft horse stallion figurine measures 6.5" x 4.3". A Hanoverian is a warm blood horse breed originating in Germany, which is often seen in the Olympic Games and other competitive English riding styles, and have won gold medals in all three equestrian Olympic competitions. Measures 7 x 2 x 5 inches. The American breed, the Morgan is distinctive for its stamina and vigor, personality, and strong natural way of moving. The Morgan was the first horse breed developed in the USA. A versatile breed, they are used for both English and western disciplines. Bay Pinto demonstrates the breed's distinctive gait. The Tennessee Walking Horse is a popular riding horse, both in horse shows and for pleasure rides. The breed is well-known for the characteristic ''running walk'' demonstrated at horse shows. 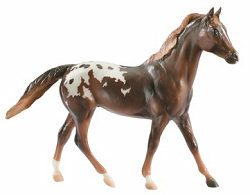 CollectA's beautiful Quarter Horse Foal - Bay is realistic from mane to tail. The most popular breed in the United States, the Quarter Horse is a strong, hardy horse suited for many activities: riding, ranching and rodeo. 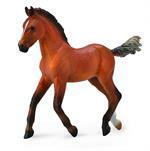 CollectA's beautiful Quarter Horse Stallion - Bay is realistic from mane to tail. The most popular breed in the United States, the Quarter Horse is a strong, hardy horse suited for many activities: riding, ranching and rodeo. Its head is triangular in shape with a straight profile, large nostrils, ears pointing slightly inwards and large, expressive eyes. Stallions have a slight crest on their neck. This prancing stallion measures 17.9cm x 12.2cm. CollectA's Mustang Foal - Bay Roan shows his spirit as he flicks his tail and arches his neck. Any minute, he could gallop after the herd. This beautiful foal measures 3.5''L x 3.1''H. Beagles are friendly and intelligent, they make terrific pets as long as they are kept busy. The 2.8''L x 1.6''H Beagle is just one of the many beautifully sculpted pieces in CollectA's Cats and Dogs Collection. The Gypsy horse should be a "strong, kind, (very) intelligent partner that works willingly and harmoniously with its handler." This Tobiano drafter foal features a tobiano coat pattern in black and white.